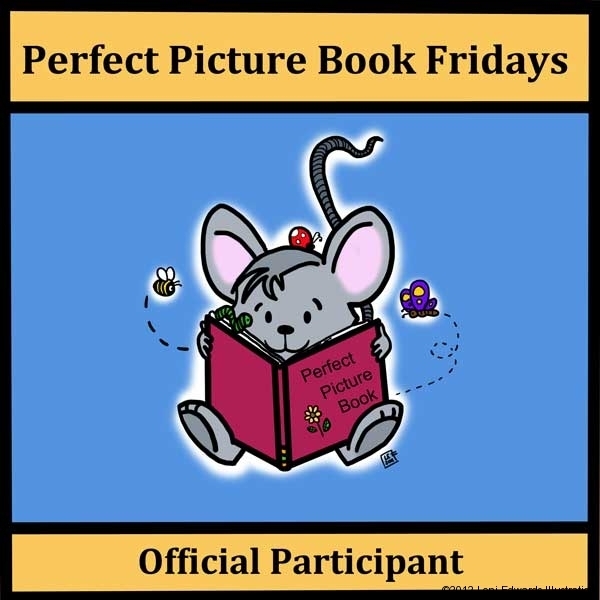 I have chosen the delightful picture book, Press Here by Hervé Tullet as my selection for Perfect Picture Book Friday. Age Range – 2 and up. Great! Now Press the yellow dot again. Press here. That’s right. Just press the yellow dot. And turn the page. motion in this joyful celebration of the power of the imagination. This book is great for teaching children left and right and the primary colors. Chronicle Books has some fun activities to download. Creating your own book with dots. Playing the children’s game: Simon Says. Why I like this book: Press Here was so much fun! It will make even the grumpiest of grumps smile 🙂 The idea is simple. This is the type of book that small children love. It gives them a chance to interact and also shows them a direct reaction. It will have the reader in giggles by the end. And then they will want to do it all over again! I would love to own the French version of this book. I think it would be a useful tool in teaching beginning French. Yes, it was a sign 🙂 Thanks for the comment Robyn! I think this book is fabulous, Loni, and I have seen kids stay amused again and again, playing with this book, even when they know what is coming. I think you are right about using the French version for beginners French! Thanks Joanna! Yes, I would have liked something like this when I first started learning. I love hands on learning. I am completely, madly, head-over-heels in love with this book and I don’t even own it yet. I’ve been holding off until my boys are a bit older, but I bet they’d enjoy it now. Placing the order! I just think it’s genius, and I love the idea of getting it in French…Thanks, Loni! I love this book, too! It is so simple and yet so brilliant! Yes, Penny, you are right. It’s a masterpiece! Omgoodness this book is so cute! Fun fun. Thanks for sharing it. I absolutely LOVE this book. I stood in the bookstore, pressing the dots and doing all the things the pages told me, not caring who might see me! I’m so glad you highlighted this one today. Haha! We were just giggling when we were doing it here at home. How fun it would’ve been to be in a bookstore! Love it! Thanks for the comment, Beth! I’ve read this one. It is indeed very fun and creative. Reminds me a bit of Little Blue and Little Yellow by Leo Lionni, but in a futuristic way (and combined with There’s a Monster at the End of This Book. My kids loved Press Here! Oh yes, those two are GREAT books! Thanks for the comment, Christie! I’m glad you selected this book Loni. It is very creative — reminds me a bit of Peter Reynolds. I love interactive books for kids — especially ones they want to read again and again. Will have to check it out. I agree, it does have a Peter H. Reynolds whimsical quality to it! Thanks for you comment! This book is well-loved in our house. It’s particularly good for small children who might have a hard time sitting still for a storybook. It’s so interactive, physical, and engaging. Yes, I could see this being a big hit with little ones! Thanks for the comment, Gina. I have been wanting to get my hands on this book for a while, as I know my boys would love it! How clever! These writers are so darn clever these days! How do they ever think of these things? Yes, it is amazing how clever and simple of an idea it is. Love it! Thanks for the comment! I wanted to get this book for my kids for Christmas — but it was sold out everywhere — locally and even online! Thanks for the reminder that I need to get this book! Oh it would be the perfect gift! I am not surprised it was sold it. It’s so much fun! I believe my giggle guy would like this one. That’s a cute video. Wasn’t that video cute? I loved it. The perfect book trailer! My girls and I just love this book. Such a simple book, but so much fun. I remember the first time I saw it at the bookstore, I started touching the dots and following the instructions too. There is just something about it. I loved this. I don’t know about the kids but I certainly would have enjoyed playing with it. Loved the video clip you provided to. It looks very addictive….lol. Great choice of book. Thanks for the comment. I was glad to have found that clip. I love the creative book trailers that are coming out! I love this book! What a marvelous concept for the very young! I have popped back to let you know that you have been awarded the Liebster Blog Award. Pop over to my blog to collect it, congrats Loni. Wow! Thanks so much! I am so excited! This is a great book! It is a favorite in our house :)I like how the book interacts with you! Good pick! I agree Erik! Thanks for the comment! I just ordered this one and now I’m really excited to read it!